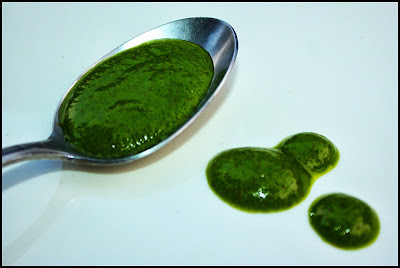 Pesto is similar to sofrito in that it is both an ingredient and a stand-alone recipe. It can be eaten as is--as a dip or spread--or added to recipes as a flavor enhancer. The word loosely translates from the Italian as "pounded," because this was originally made with a mortar and pestle. But with the aid of a blender this is one of the easiest recipes you'll ever make. It is classically made with basil, pine nuts, garlic, olive oil, and cheese, but ingredients can be interchanged. Tonight, for example, I made it with basil and parsley (which were still growing in the garden), almonds that I had in my pantry, garlic, olive oil, Parmesan, and a single hot pepper that was still growing in the garden. I tossed it with pasta for dinner and froze what I didn't use. Here's a basic recipe.